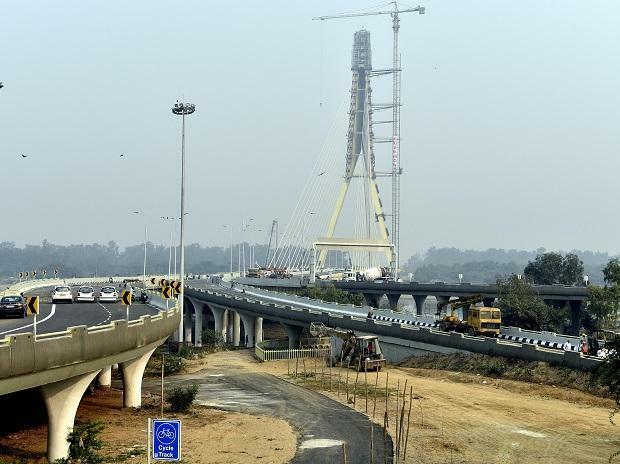 The Signature bridge over the Yamuna inaugurated at an eventful function Sunday is double the height of Qutub Minar and has been delayed over 14 years. The new landmark connect the Wazirabad across the river Yamuna to the inner city and will reduce the travel time between north and northeast Delhi. Inaugurating the bridge with a 154-metre pylon, Delhi Chief Minister Arvind Kejriwal and his deputy Manish Sisodia said that it will be a centre of attraction among local and international tourists who come to Delhi to visit historical monuments and buildings like India Gate and Qutub Minar. The bridge will be a big relief to huge number of commuters who were earlier stuck up in long traffic jams over a narrow bridge in Wazirabad area. The bridge will reduce the commuting time between northeast areas and the inner city from 45 minutes to just 10 minutes, saving the pollution and fuel, a government statement said. The boomerang-shaped pylon consists of two inclined columns, which are rigidly connected to the driving lanes and bend mid-way. The upper portion of the pylon anchors the backstay cables as well as the main-span cables, arranged in a harp like manner, the statement said. The pylon from a distance looks like hands folded in a greeting posture. Its top is created by a 22-metre high steel-glass structure, which will provide a panoramic view of Delhi. Visitors will be taken in four elevators with a total capacity of carrying 50 people to a 154-metre-high glass box on the top of the bridge to provide them a bird's-eye view of the city, the statement said. Announced in 2004, the bridge missed several deadlines since 2011. The proposal for the bridge, mooted in 2004, received approval of the Delhi Cabinet in 2007. It was initially expected to be completed at a modified estimate of Rs 11.31 billion for the Commonwealth Games, held in Delhi in October 2010. In 2015, the cost of the project rose to Rs 15.94 billion. Sisodia claimed that the actual work on the bridge started when AAP came to power in 2015 although the idea of it was conceived way back in 1997 by the then Chief Minister Sahib Singh Verma. He also said that an additional cost of around Rs 350 was raised by engineers as there was a huge underground rock and it needed to be stabilised for safety. He also alleged that the Centre created "obstacles" so that the bridge was not completed in Arvind Kejriwal regime.